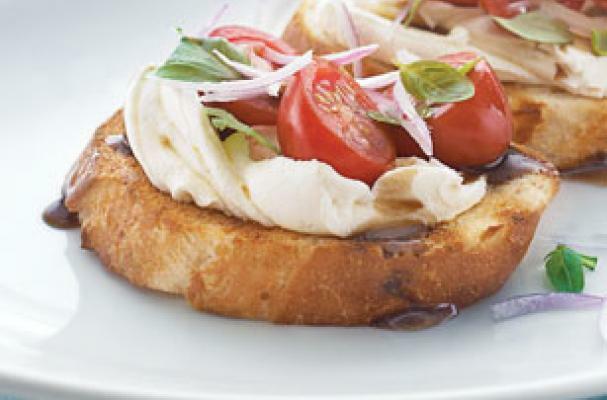 Tomato and cream cheese bruschetta is a simple appetizer to serve during your summer parties. Garden tomatoes are paired with slivers of red onion, basil and a balsamic vinaigrette and served on slices of bread with cream cheese. Onion can sometimes be an overpowering ingredient so I recommend soaking the slices in ice cold water to tame the flavor. Feel free to change up this recipe based on what's available in your garden or at the farmers market. Roasted red peppers or grilled zucchini would also work with this dish. Place bread slices in single layer on baking sheet. Bake 3 to 4 min. on each side or until toasted on both sides. Rub with garlic. Cool. Spread toast slices with reduced-fat cream cheese; top with tomatoes and onions. Whisk vinegar, oil, sugar and pepper until blended; drizzle over toast slices. Top with basil.